“We are now sitting at Lord’s – where it is cold, wet and windy – thinking of the days we have just spent in Udaipur. It is difficult to put in words our sincere gratitude for the arrangements which were made to accommodate us with such thoughtfulness and grace. There are few occasions in one’s life which may truly be described as unforgettable. 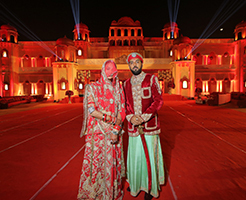 However our attendance at the Royal Wedding has provided us with warm and lasting memories of Udaipur. Our stay at the beautiful Taj Lake Palace and the wonderful events which we were honoured to attend were organised with utmost precision. We retain fond collections. How kind it was of Your Highness to arrange for us to be conveyed to the Shaadi Ri Goth in the 1961 Triumph Herald Convertible on Friday evening. We were thrilled to ride in the beautiful vehicle and should like to thank the driver for the patience he displayed whilst we were enjoying the evening. The whole experience was wonderful. With so many matters that must have been claiming the attention of Your Highness, to make such special plans for us was so kind and remarkable. The ‘Thank You’ letter from Mr Neville and Ms Margaret Pinkney, dear friends from the Isle of Man, holds a special place for us. They wrote: “Margaret and I have just returned from the wonderful celebrations of the wedding of Lakshyaraj and Nivritti. We would like first to thank you for your very kind invitation to attend, and for the most generous present we received from you. We were excited and deeply honoured to receive the invitation. The friendship with you and your family over many years has meant a great deal to us and we seen all the children grow and develop their invidual strengths during that time. In recent years, we have been privileged to see Lakshyaraj grow in confidence and maturity into a young man of whom I am sure you feel very proud. He has taken on an increasing number of roles within the Mewar family duties and responsibilities with dedication and professionalism. It was a great pleasure for us to meet briefly with his new bride, Nivritti. They looked very happy together and we wish them every happiness in the years ahead.